Previously, I wrote about hormesis*, which is the strange tendency of living things to languish when conditions are ideal, and thrive best when life is tougher. Lab animals are found to live longer when they are underfed, exposed to toxins or radiation or pathogens or temperatures that are uncomfortably high or low. I will follow up in this column with more about Caloric Restriction, which is the clearest example of hormesis. Then I mean to expand and clarify the statement about the implications of hormesis for evolution, and for our understanding of aging. Hormesis is where my study of aging began, though I did not yet know the word. In 1996, I learned for the first time that many animals live longer when they are underfed, and their life span continues to increase with decreasing calorie intake, right up to the threshold of starvation. I drew the logical conclusion: It does not make sense that animals would be able to do something when they are starving that they are unable to do when they have enough to eat. If animals have shortened life spans when they have all the food they need, it means that their genes are not evolved for maximum life span. Aging must be“voluntary”, in the sense of a genetic program, crafted by natural selection. Quite simply: if animal metabolisms were “trying” to live as long as possible, then certainly “as long as possible” would be shorter when they have plenty of food, and when they don’t have to fight off various diseaes or repair damage from radiation or injuries, or expend energy in running. This is the realization that convinced me I had a mission and a message in the field of evolutionary biology of aging. 18 years ago, it was a guess based on a single piece of information, but much that I have learned in intensive study since that time has confirmed the proposition that aging is programmed into our genes. There are many other forms of hormesis, sampled in last week’s column. Additional proof comes from the fact that the genetic basis for aging is very old. Genes that regulate life span are closely related in species as diverse as worms and mice and even yeast cells, though they represent branches of an evolutionary tree that diverged more than half a billion years ago. Of course, there are many genes that we share with these early life forms, but all of them are involved in core life processes of the cell, like replication and transcription and energy production. We can only conclude that nature has treated aging like a core life process. The connection between less food and longer life predates modern scientific study. Hippocrates hints at it. In 15th Century Venice, Luigi Cornaro wrote a volume titledDiscorsi della vita sobria (Discourses On the Temperate Life) about his personal experiments with caloric restriction, supplemented by half a litre of wine daily. Cornaro lived to 102. Benjamin Franklin wrote in Poor Richard’s Almanac, “To lengthen thy life, lessen thy meals.” (1733). In the depression of the 1930s, the issue of widespread malnutrition was discussed in America. How would it affect people’s health and longevity if they did not have enough to eat? Clive McCay was a young researcher at Cornell when he received a grant to study the relationship between delayed growth and life span in rats. McCay wasn’t thinking in terms of hormesis, and evolution was far from his thought process. In fact, his framework was rooted in the (discredited) rate of living theory. He thought that perhaps growth, development and aging are all synchronized on a common clock, so that if he could delay growth and maturation, then perhaps aging would be delayed as well. In fact, the way that McCay controlled his rats’ diet was to give them just enough to eat to keep them from dying, without allowing them to gain weight. His experiments with underfeeding produced dramatic results, but they were not recognized as being important, and there was little follow-up for almost half a century. The modern re-discovery of Caloric Restriction (CR) came when Roy Walford served as “house doc” in the Biosphere II experiment in Arizona, 1991-93. This was to be a hermetically-sealed environment in which a team of bionauts grew all their own food, recycled all their water and even used photosynthesis to supply their oxygen. But farm productivity was way below expectations, so the crew didn’t have enough to eat. Walford noticed that underfeeding the bionauts had dramatic health benefits, though it made them irrascible. Over the years, experiments have been done with yeast cells, worms, fruit flies and other inspect species, arachnids, crustaceans, fish, various rodents, dogs, horses, and rhesus monkeys [Ref]. A project at Washington University has followed the health histories of people who practice CR [Ref], though mortality comparisons may not be available for a long while. Shorter-lived animals tend to show greater proportional life extension, but health and longevity benefits were discerned even in the monkeys, with a life span of 25 years [Ref1, Ref2]. McCay’s guess about a biological clock and delay of development turned out, at best, to be only partially correct. CR works even if begun in adult animals. Life extension is not as great as when begun earlier, but qualitatively the effect is the same. Results of caloric restriction experiments typically look like the graph on the right, which is regarded as the “real McCay”. Lab mice normally live two years, and with a severely restricted calorie intake they can survive for three. Dogs typically live an extra 2 years on CR. The longer the life span, the less the proportional gain. Some reporting in the popular press would lead you to think that the long-term experiments in Rhesus monkeys found little or no gain in longevity, butI’ve viewed the results as positive, though there were plenty of interesting complications. CR in humans has attracted many enthusiasts. It’s a very individual practice. Some people have been overweight most of their lives, and are trying to get their weight under control; others are very skinny, and disciplining themselves to be yet thinner. There are major differences between people who take lots of supplements and people who go “natural” or “paleo”. The greatest diversity is around exercise: Some people on CR are also doing high-intensity exercise programs. Exercise independently increases life expectancy, and has health benefits in the present. Exercise is the most robust and long-lasting anti-depressant known to psychological science. (Personally, I tend to swim with this school.) There are others who avoid exercise, because exercise burns calories, and this inevitably leads to more eating. They are tracking calories rather than weight. 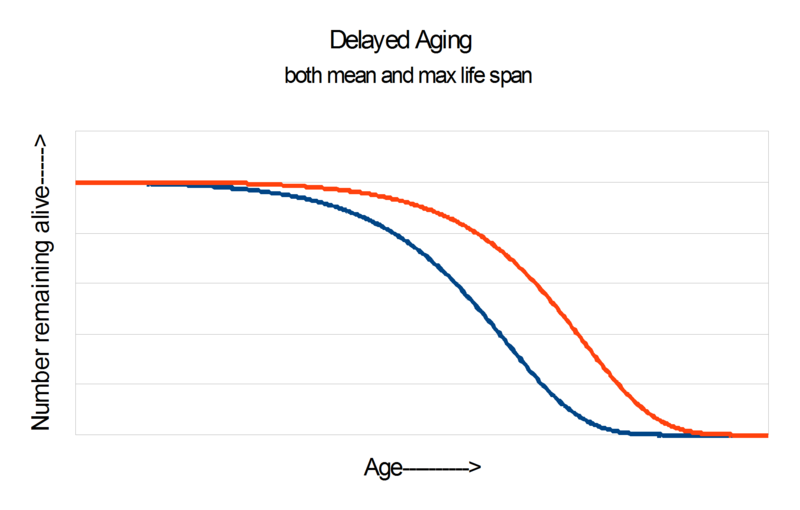 People in this school often base their thinking on the fact that exercise increases only mean life expectancy but not maximum life expectancy (see above two graphs), so it does “not truly slow aging”. My response to this is to re-phrase the issue: Yes, there are a lucky 2% of people who will live a long time whether they exercise or not, but there are 50% of people who delude themselves into thinking that they are in that 2%. Read stories and get a sense of the culture at CRSociety.org. Of course, there are many other people who have decided that the discomfort and discipline of either calorie restriction or exercise are too high a price for the (substantial) improvement in health or the (modest) increase in life expectancy. An important implication of the CR experiments is that life span is extended not through some physiological action, but through the effect on signaling. This carries a powerful message for evolutionary understanding. Aging is not simple accumulation of damage, because the damage can be delayed by mere chemical signals, or instructions to the living metabolism. Here’s a sample of some of the studies that demonstrate this. From Cynthia Kenyon’s UCSF lab, it was reported that merely sensing (“smelling”) food without actually ingesting the calories was sufficient to cancel some of the life extension from food restriction in worms. The same lab discovered one of the genes (DAF16) that served as point man for the CR response. They were able to genetically engineer worms that had the DAF16 gene only in their muscle cells, or only in their nerve cells, or only in their digestive cells. From experiments with these mosaic worms, they were able to show that it was the nervous system that dictates the life span. In experiments with rodents, every-other-day feeding extends life span, even though the animals eat so much on the in-between days that they get almost the same number of calories as fully-fed animals. Harrison and Archer theorized that the CR response originated as an adaptation to famine. During a famine, it would not pay an animal to reproduce, because its offspring would probably starve. Better to conserve resources and try to live out the famine. In fact, those animals that managed to survive past the famine would have an opportunity to deliver their offspring into a world where food was once more plentiful and competition for that food was thinned by starvation. Their genes would seed a renewed population with enhanced opportunity for success. This shows that the life extension is not caused by restraining reproduction. There are two independent signals, one that shuts off fertility and one that turns on longevity. Here’s my paper on the subject. Once again, the message is that aging is controlled by signaling, and the signaling for aging rate is separable from the signals that control reproduction. The idea of “conserving resources” is a red herring, because aging is not caused by scarcity of resources. Why have so many smart biologists missed this message? Most biologists have been led astray by evolutionary theory. This happens both directly (because they understand the deep conflict between the ideas of evolved aging and the Selfish Gene) or indirectly (because they are immersed in a cultue that reveres nature, and they believe nature has made each individual just as strong and as durable as possible). Darwin’s vision of natural selection says that the name of the game is to prevail in evolutionary competition, to survive and to leave more offspring than your compatriots. Aging destroys your competitiveness and cuts off your fertility. Aging is the opposite of fitness, and the idea that aging could be “adaptive” is absurd on its face, a non-starter. But that’s what nature is telling us, so we’d better find a way to re-fashion our theories to accommodate reality. As I mentioned last week, Harrison and Archer’s theory about CR actually points us to the place where evolutionary theory needs to be corrected. Animals are not just adapted to be prime individual competitors, but also to be members of a stable ecosystem. Ecosystem collapse is a very real danger. It can happen in a single generation, and presumably that is exactly what has happened many, many times in the deep past. As a result of natural selection among ecosystems, we have today a world of relative stability and homeostasis. I have explained in a previous columns my Demographic Theory of Aging, and I have academic articles on the subject  and . The bottom line is that starvation in nature is ubiquitous, and it is especially dangerous to the community. Starvation tends to happen to happen to everyone or no one. (If I can’t find anything to eat, then chances are that you can’t either.) Natural selection has responded by designing individuals to die on an individual schedule, so they don’t all die at once. Even better, natural selection has arranged to relax the schedule when starvation is afoot, because at times when many are dying of starvation, the last thing the community needs is for more to die of old age. * I am grateful to readers who pointed me to two factual errors that made such good stories. Paraquat is not the same as Agent Orange, which became infamous in the Vietnamese war. Both are defoliant poisons, and strong oxidants, but they are chemically quite different. Survivors of Hiroshima and Nagasaki did not have lower cancer rates later in life. They had elevated cancer rates, as you would expect. Some epidemiologists claim to see a signature of hormesis in the data of those whose radiation exposure was quite small. …thanks for keep me honest. I think the thrust of the narrative is intact.